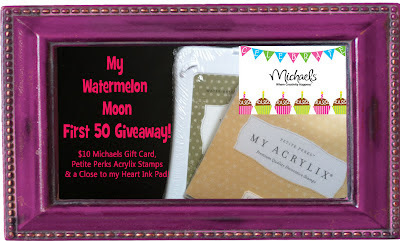 My Watermelon Moon: First 50 Giveaway! I'm Super excited to host my first Giveaway! I made my first goal and I want to share a little celebration with you! Goal #1 was to get to 50 followers. I have had this blog since January, but really started posting in August. There is a lot to learn! Thank you for joining me in this journey and becoming a fan, I am so happy to have you as my new friend! 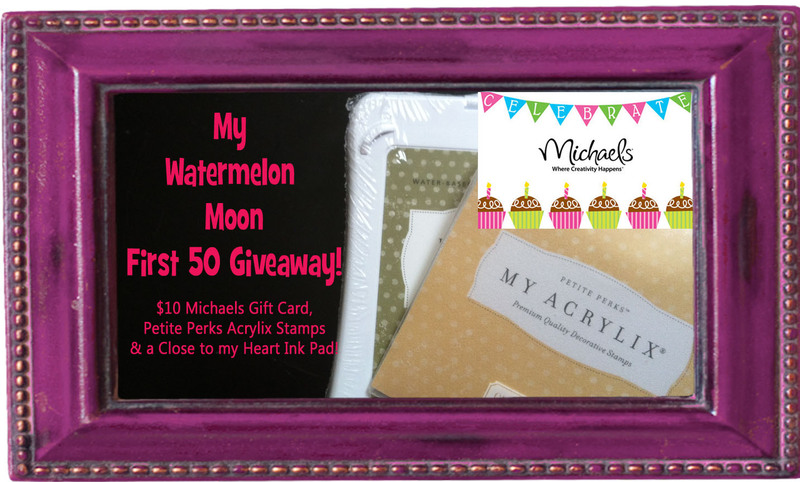 Today's giveaway is a Michaels $10 gift card and two Close to my Heart products: Petite Perks Acrylix Stamp set (only) and an Exclusive Ink pad! To enter, you must be a follower here or on Facebook. I will draw a name on Sunday, Sept 16th! That's it! Oh, and the giveaway's will get bigger and better as I reach each now goal! Next goal? 100! Congrats Melissa for reaching your goal. I am a follower & I subscribe via email. 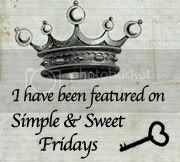 I think your blog looks GREAT!!! 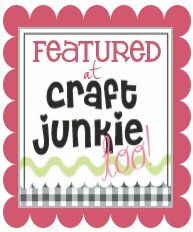 I really enjoy all your posts so any project you do would be wonderful but I am always looking for fun new scrapbook page ideas. TFS and for the chance to win a nice prize too. God bless. Congrats on reaching your first goal, I am sure you will have many more. 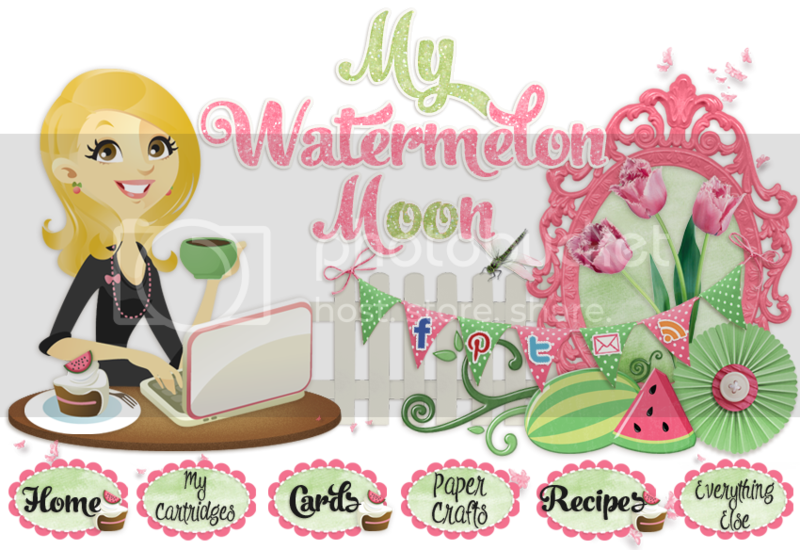 I love your blog and all the watermelons!! I like to do all of the above..anything paper, but my fave thing is cards! Congrats on reaching your first goal!! I want to as well do something along these lines I have not had my blog long I have a long ways to go :) My favorite thing is Cards, my whole blog is cards :) hope you reach your second goal quickly. Returning the follow! Thanks so much for stopping and by and following! cards and congrats on your giveaway. Returning the favor and now following your blog too. Look forward to reading more!! Hi Melissa! Congratulations on your first giveaway! I haven't done one yet but I hope to soon. I'm a crafter who mostly likes to make my own home decor. Happy to be following you via GFC! Hi there and welcome to the bloggy word. I just started blogging in February of this year and you're right...there is a lot to learn. I've been loving it though and hope you will too. Looks like you're off to a great start! Keep up the great work!! YEAH!! Great job and I love the watermelon theme you have going on. When I have time for crafts, I like to do more home decor. Yip-pee I love a giveaway...count me in I'm new follower visiting from Dixie n Dottie. Come see me and follow back if ya can.